Was the result successful? House Beautiful had no reservations about the remodel job. 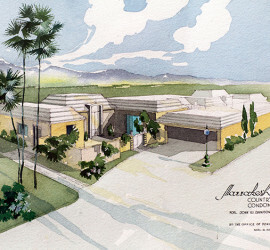 “In the enchanted hour of dusk, one might be reliving the past in a columned villa of Basae..."
Born in Atlanta, Georgia in 1910, John Elgin Woolf moved to Hollywood in 1936 after studying architecture at Georgia Institute of Technology. 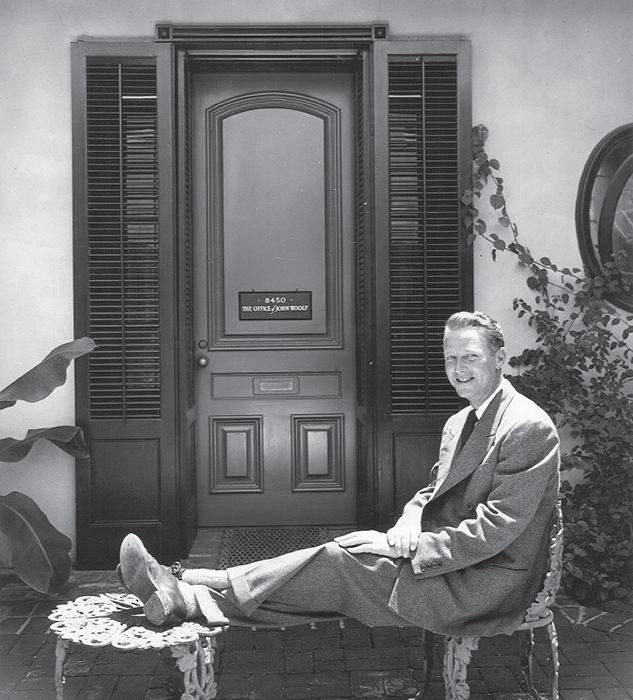 He hoped his Southern accent would land him a role in Gone with the Wind, but when he met George Cukor, the film’s director, it marked the beginning of a quite different career in the movies. Let into influential circles with Cukor’s assistance, the young designer’s drawings garnered attention, and soon, clients. Heralded as “architect to the stars,” Woolf gave film royalty a new luxury style. According to The New York Times, Woolf “established a new vocabulary for glamorous movie-star living … synthesized 19th-century French, Greek Revival and Modernist touches into a heady mixture that has since been christened Hollywood Regency, which foreshadowed aspects of postmodernism.” He designed houses for many luminaries, including Judy Garland, Cary Grant, Bob Hope, David O. Selznick, Katherine Hepburn and Spencer Tracy. John Elgin Woolf: Master of Hollywood Regency, on view at Palos Verdes Art Center March 20 through May 29, presents selections from the Woolf archive housed at the Art, Architecture & Design Museum at University of California, Santa Barbara. Included are more than 50 examples of Woolf’s drawings and photographs of his works, along with business correspondence from the Los Angeles firm he shared with his partner, the interior designer Robert Koch Woolf, which was active from 1940 until his death in 1980. Known for a theatricality that echoed the flamboyance of movie sets, Hollywood Regency style eschewed the spare Bauhaus-derived designs built by many architects in Southern California during the postwar period. Though aligned with tradition in the contention with modernism, Hollywood Regency followed neither camp’s insistence on purity. Not just a rehash of French and English Regency styles, it delights instead to innovate by combining elements from a plethora of sources to create voluptuous fantasies. Like East Coast furniture designer James Mont, who freely mixed Beaux Arts elements and Chinoiserie in his mid-century designs, Woolf incorporated French mansard roofs, Doric columns, oval windows and Neoclassical urns in his buildings without falling into pastiche. Key to Woolf’s success was his genius with scale and proportion. One of his signatures, the Pullman door, so-called because it juts above the adjoining roofline like an exaggerated entrance to a Pullman coach, is “out of scale.” As used by Woolf, the unexpected sight tricks the eye to imagine the large building as something miniature. A jewel box, perhaps. But it is his interiors that offer the greatest delights. The rooms are made to embrace vignettes ready for the camera, appearing greater than their floor sizes due to expanses of glass and mirrors. A favorite ruse was the “floating fireplace,” that vents the flue to small columns on either side, as a pane of glass surmounts the mantel in place of the expected chimney—an illusion worthy of Magritte. 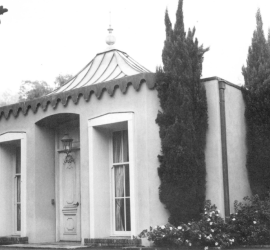 Woolf worked primarily in the Bel Air and Beverly Hills districts of Los Angeles, often renovating older buildings, but also did work as far away as Nassau, such as the residence for Lady Stanley of Adderlay, also known as Mrs. Clark Gable. One of his largest projects was the design of Marrakesh Country Club in Palm Desert, California. Brought in by golf developer Johnny Dawson, Woolf laid out a clubhouse, gates, and 364 homes in fourteen neighborhoods with golf courses on the 155-acre spread. Begun in 1968 and completed a decade later, the desert fantasy stands out as one of the most ambitious turns in the Palm Desert quest for luxury. Available to schools and community groups. 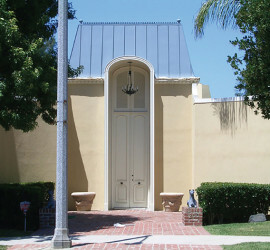 Tours can be arranged by contacting Gail Phinney at GPhinney@pvartcenter.org or calling 310.541.2479 X 305.